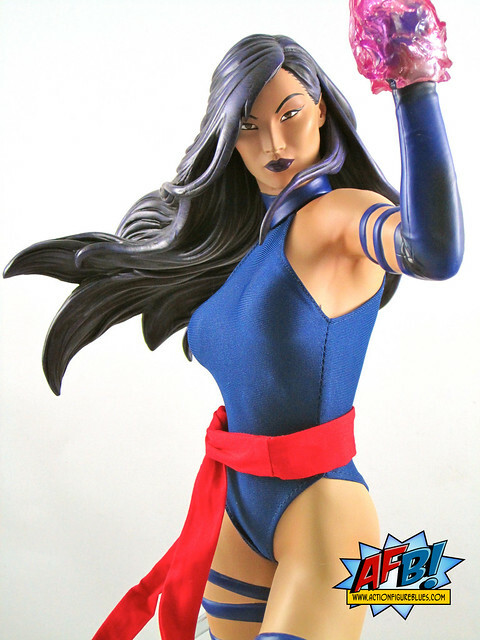 AFB is back in the review saddle with Sideshow's Premium Format Psylocke! It’s been some time since I managed to get a review of one of my own purchases up, what with the AFB Podcast taking up most of my “geek time” these days. While I haven't been posting reviews, I certainly have still been avidly collecting, so I thought it was high time I get back to getting some of them up here on the site - and tonight’s is a real beauty! Sideshow has been aiming many of their X-Men efforts at fans of the Jim Lee era, but I passed on the Exclusive for this as the head that comes with the Regular Edition suited me fine as it was less stylistic to a certain era. Some controversy was created when Sideshow changed both headsculpts after the item went up for pre-order, but in my opinion (and I may be in the minority) the changes to the regular head were for the better and I’m satisfied with it. This figure has not been without its own QC issues, with a number of collectors reporting cracking in the flesh coloured paint on Psylocke’s legs. Mine has shown no side of this defect after a couple of months on display - much to my relief, as I would not like to have to deal with returning an item this big all the way from Australia! One word of warning for those assembling this figure - the head doesn’t go on at the angle you expect, so check the photos carefully before inserting and proceed with caution. I managed to make a (thankfully very tiny) mark on my Psylocke’s shoulder by trying to put the head on the wrong way. Check those angles! The Premium Format pieces are becoming less mixed-media and more sculpted, which is an issue for some but not a big problem with me. Being a “statue guy”, I don’t mind the idea of these being larger statues. I do often wonder how the fabric will wear on these. 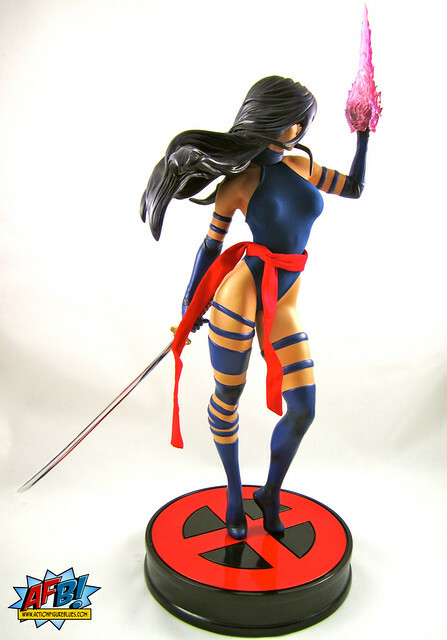 For Psylocke, the cloth elements are her barely-there (especially at the back!) swimsuit, and her red sash. 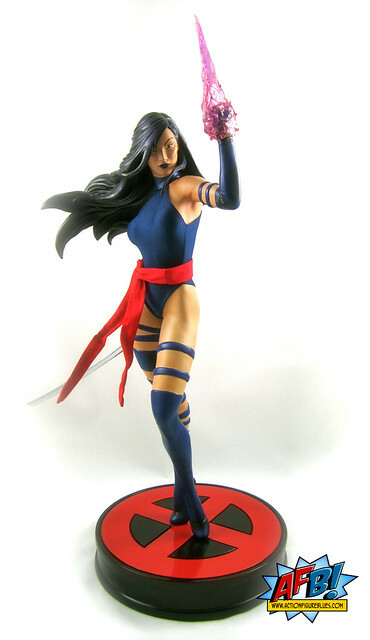 The regular version comes with a swap-out option for Psylocke’s left hand. She can either wield a second katana which is held behind her back at an angle, or emanate her trademark psychic knife, which is the option I’ve chosen. Both the katanas and the psychic knife are nicely done, with translucent material used for the psychic knife to great effect. This statue comes with the traditional X-Base, which is good in terms of tying the X-Figures together, but takes a bit away from the piece for me as I enjoy some of the earlier Premium Format pieces that had bases that reflected a bit more of the character - for example, She-Hulk holding a parking meter or Black Cat opening a safe. Next up for the X-Ladies will be Storm in early 2013, and we also have Scarlet Witch and Spider-Woman to look forward to. It’s a good time to be a Marvel Premium Format Collector! You can see more pics at Facebook, and discuss this at the AFB Forum!